Thermodynamics sometimes distinguishes five classes of systems, defined in terms of what is allowed to cross their boundaries. There is no mechanical boundary for the whole earth including its atmosphere, and so roughly speaking, no external work is done on or by the whole earth system. Such a system is sometimes said to be diabatically heated or cooled by radiation. In the table, ± denotes a permitted type of transfer, and 0 denotes a non-permitted type of transfer. In theoretical studies, it is often convenient to consider the simplest kind of thermodynamic system. This is defined variously by different authors.For the present article, the following definition will be convenient, as abstracted from the definitions of various authors. A region of material with all intensive properties continuous in space and time is called a phase. A simple system is for the present article defined as one that consists of a single phase of material with no interior partitions. Engineering and natural processes are often described as composites of many different component simple systems, sometimes with unchanging or changing partitions between them. There are two fundamental kinds of entity in thermodynamics, states of a system, and processes of a system. This allows two fundamental approaches to thermodynamic reasoning, that in terms of states of a system, and that in terms of cyclic processes of a system. The approach through states of a system requires a full account of the state of the system as well as a notion of process from one state to another of a system, but may require only a partial account of the state of the surroundings of the system or of other systems. The notion of a cyclic process does not require a full account of the state of the system, but does require a full account of how the process occasions transfers of matter and energy between the system and its surroundings, which must include at least two heat reservoirs at different temperatures, one hotter than the other. In this approach, the notion of a properly numerical scale of temperature is a presupposition of thermodynamics, not a notion constructed by or derived from it. The method of description in terms of states has limitations. For example, processes in a region of turbulent flow, or in a burning gas mixture, or in a Knudsen gas may be beyond "the province of thermodynamics". This problem can sometimes be circumvented through the method of description in terms of cyclic processes. This is part of the reason why the founders of thermodynamics often preferred the cyclic process description. Thermodynamic state variables When a system is at thermodynamic equilibrium under a given set of conditions of its surroundings, it is said to be in a definite thermodynamic state, which is fully described by its state variables. If a system is simple as defined above, and is in thermodynamic equilibrium, and is not subject to an externally imposed force field, such as gravity, electricity, or magnetism, then it is homogeneous, that is say, spatially uniform in all respects. In a sense, a homogeneous system can be regarded as spatially zero-dimensional, because it has no spatial variation. If a system in thermodynamic equilibrium is homogeneous, then its state can be described by a few physical variables, which are mostly classifiable as intensive variables and extensive variables. Examples of extensive thermodynamic variables are total mass and total volume. 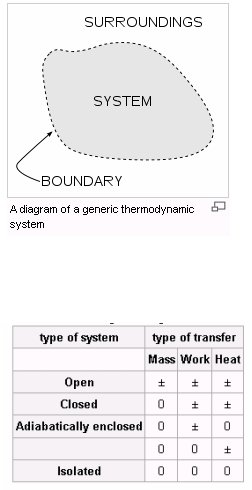 Examples of intensive thermodynamic variables are temperature, pressure, and chemical concentration; intensive thermodynamic variables are defined at each spatial point and each instant of time in a system. Physical macroscopic variables can be mechanical or thermal.Temperature is a thermal variable; according to Guggenheim, "the most important conception in thermodynamics is temperature." Intensive variables are defined by the property that if any number of systems, each in its own separate homogeneous thermodynamic equilibrium state, all with the same respective values of all of their intensive variables, regardless of the values of their extensive variables, are laid contiguously with no partition between them, so as to form a new system, then the values of the intensive variables of the new system are the same as those of the separate constituent systems. Such a composite system is in a homogeneous thermodynamic equilibrium. Examples of intensive variables are temperature, chemical concentration, pressure, density of mass, density of internal energy, and, when it can be properly defined, density of entropy. Extensive variables are defined by the property that if any number of systems, regardless of their possible separate thermodynamic equilibrium or non-equilibrium states or intensive variables, are laid side by side with no partition between them so as to form a new system, then the values of the extensive variables of the new system are the sums of the values of the respective extensive variables of the individual separate constituent systems. Obviously, there is no reason to expect such a composite system to be in in a homogeneous thermodynamic equilibrium. Examples of extensive variables are mass, volume, and internal energy. They depend on the total quantity of mass in the system. Though, when it can be properly defined, density of entropy is an intensive variable, for inhomogeneous systems, entropy itself does not fit into this classification of state variables. The reason is that entropy is a property of a system as a whole, and not necessarily related simply to its constituents separately. It is true that for any number of systems each in its own separate homogeneous thermodynamic equilibrium, all with the same values of intensive variables, removal of the partitions between the separate systems results in a composite homogeneous system in thermodynamic equilibrium, with all the values of its intensive variables the same as those of the constituent systems, and it is reservedly or conditionally true that the entropy of such a restrictively defined composite system is the sum of the entropies of the constituent systems. But if the constituent systems do not satisfy these restrictive conditions, the entropy of a composite system cannot be expected to be the sum of the entropies of the constituent systems, because the entropy is a property of the composite system as a whole. Therefore, though under these restrictive reservations, entropy satisfies some requirements for extensivity defined just above, entropy in general does not fit the above definition of an extensive variable. Being neither an intensive variable nor an extensive variable according to the above definition, entropy is thus a stand-out variable, because it is a state variable of a system as a whole. A non-equilibrium system can have a very inhomogeneous dynamical structure. This is one reason for distinguishing the study of equilibrium thermodynamics from the study of non-equilibrium thermodynamics. The physical reason for the existence of extensive variables is the time-invariance of volume in a given inertial reference frame, and the strictly local conservation of mass, momentum, angular momentum, and energy. As noted by Gibbs, entropy is unlike energy and mass, because it is not locally conserved.The stand-out quantity entropy is never conserved in real physical processes; all real physical processes are irreversible. The motion of planets seems reversible on a short time scale (millions of years), but their motion, according to Newton's laws, is mathematically an example of deterministic chaos. Eventually a planet will suffer an unpredictable collision with an object from its surroundings, outer space in this case, and consequently its future course will be radically unpredictable. Theoretically this can be expressed by saying that every natural process dissipates some information from the predictable part of its activity into the unpredictable part. The predictable part is expressed in the generalized mechanical variables, and the unpredictable part in heat. There are other state variables which can be regarded as conditionally 'extensive' subject to reservation as above, but not extensive as defined above. Examples are the Gibbs free energy, the Helmholtz free energy, and the enthalpy. Consequently, just because for some systems under particular conditions of their surroundings such state variables are conditionally conjugate to intensive variables, such conjugacy does not make such state variables extensive as defined above. This is another reason for distinguishing the study of equilibrium thermodynamics from the study of non-equilibrium thermodynamics. In another way of thinking, this explains why heat is to be regarded as a quantity that refers to a process and not to a state of a system. A system with no internal partitions, and in thermodynamic equilibrium, can be inhomogeneous in the following respect: it can consist of several so-called 'phases', each homogeneous in itself, in immediate contiguity with other phases of the system, but distinguishable by their having various respectively different physical characters, with discontinuity of intensive variables at the boundaries between the phases; a mixture of different chemical species is considered homogeneous for this purpose if it is physically homogeneous. For example, a vessel can contain a system consisting of water vapour overlying liquid water; then there is a vapour phase and a liquid phase, each homogeneous in itself, but still in thermodynamic equilibrium with the other phase. For the immediately present account, systems with multiple phases are not considered, though for many thermodynamic questions, multiphase systems are important. Equation of state The macroscopic variables of a thermodynamic system in thermodynamic equilibrium, in which temperature is well defined, can be related to one another through equations of state or characteristic equations. They express the constitutive peculiarities of the material of the system. The equation of state must comply with some thermodynamic constraints, but cannot be derived from the general principles of thermodynamics alone. Thermodynamic processes A thermodynamic process is defined by changes of state internal to the system of interest, combined with transfers of matter and energy to and from the surroundings of the system or to and from other systems. A system is demarcated from its surroundings or from other systems by partitions which may more or less separate them, and may move as a piston to change the volume of the system and thus transfer work. Dependent and independent variables for a process A process is described by changes in values of state variables of systems or by quantities of exchange of matter and energy between systems and surroundings. The change must be specified in terms of prescribed variables. The choice of which variables are to be used is made in advance of consideration of the course of the process, and cannot be changed. Certain of the variables chosen in advance are called the independent variables. From changes in independent variables may be derived changes in other variables called dependent variables. For example a process may occur at constant pressure with pressure prescribed as an independent variable, and temperature changed as another independent variable, and then changes in volume are considered as dependent. Careful attention to this principle is necessary in thermodynamics. Changes of state of a system In the approach through states of the system, a process can be described in two main ways. In one way, the system is considered to be connected to the surroundings by some kind of more or less separating partition, and allowed to reach equilibrium with the surroundings with that partition in place. Then, while the separative character of the partition is kept unchanged, the conditions of the surroundings are changed, and exert their influence on the system again through the separating partition, or the partition is moved so as to change the volume of the system; and a new equilibrium is reached. For example, a system is allowed to reach equilibrium with a heat bath at one temperature; then the temperature of the heat bath is changed and the system is allowed to reach a new equilibrium; if the partition allows conduction of heat, the new equilibrium will be different from the old equilibrium. Cyclic processes A cyclic process is a process that can be repeated indefinitely often without changing the final state of the system in which the process occurs. The only traces of the effects of a cyclic process are to be found in the surroundings of the system or in other systems. This is the kind of process that concerned early thermodynamicists such as Carnot, and in terms of which Kelvin defined absolute temperature, before the use of the quantity of entropy by Rankine and its clear identification by Clausius. For some systems, for example with some plastic working substances, cyclic processes are practically nearly unfeasible because the working substance undergoes practically irreversible changes.This is why mechanical devices are lubricated with oil and one of the reasons why electrical devices are often useful. A cyclic process of a system requires in its surroundings at least two heat reservoirs at different temperatures, one at a higher temperature that supplies heat to the system, the other at a lower temperature that accepts heat from the system. The early work on thermodynamics tended to use the cyclic process approach, because it was interested in machines which would convert some of the heat from the surroundings into mechanical power delivered to the surroundings, without too much concern about the internal workings of the machine. Such a machine, while receiving an amount of heat from a higher temperature reservoir, always needs a lower temperature reservoir that accepts some lesser amount of heat, the difference in amounts of heat being converted to work. Later, the internal workings of a system became of interest, and they are described by the states of the system. Nowadays, instead of arguing in terms of cyclic processes, some writers are inclined to derive the concept of absolute temperature from the concept of entropy, a variable of state. It is often convenient to study a thermodynamic process in which a single variable, such as temperature, pressure, or volume, etc., is held fixed. Furthermore, it is useful to group these processes into pairs, in which each variable held constant is one member of a conjugate pair. It is sometimes of interest to study a process in which several variables are controlled, subject to some specified constraint. In a system in which a chemical reaction can occur, for example, in which the pressure and temperature can affect the equilibrium composition, a process might occur in which temperature is held constant but pressure is slowly altered, just so that chemical equilibrium is maintained all the way. There will be a corresponding process at constant temperature in which the final pressure is the same but is reached by a rapid jump. Then it can be shown that the volume change resulting from the rapid jump process is smaller than that from the slow equilibrium process. The work transferred differs between the two processes. Thermodynamic potentials are different quantitative measures of the stored energy in a system. Potentials are used to measure energy changes in systems as they evolve from an initial state to a final state. The potential used depends on the constraints of the system, such as constant temperature or pressure. For example, the Helmholtz and Gibbs energies are the energies available in a system to do useful work when the temperature and volume or the pressure and temperature are fixed, respectively.